Biodiesel has long been a workhouse of the nation’s renewable fuel industry, and Ford Motor Company wants to make sure the green fuel is used in work vehicles that also get things done. Jon said Ford is all about choice, and he hopes workers will consider Ford options, especially those that run on biodiesel. 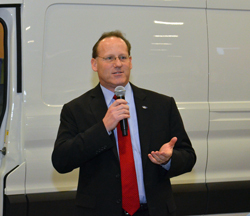 He also told the audience that the new biodiesel-compaitible F-650s and 750s coming this summer will be built in the U.S., just like biodiesel, bringing jobs back to America.